Engine 45 is a 1991 Pierce Lance pumper. With a 1500 GPM pump with a 750 booster tank. It carries 1,000ft. of 5" supply line and numerous attack lines and sizes,thermal imaging camera,and various hand tools. 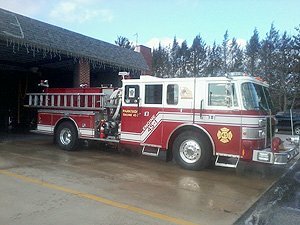 Engine 45 seats 8 firefighters, and runs first out on all building fires to mutual aid companies. TAC 45 is a 2006 Seagrave Marauder II with a Waterous CS/CM Series 1250 GPM, 2-Stage pump with a 500 gallon tank 1,000ft of 5" supply line. TAC 45 responds to all "shoe runs", first due building fires along with car fires and all outside fires in the boro. And runs first out for all second alarm fires in the City of Chester. This unit WAS the last Marauder built! 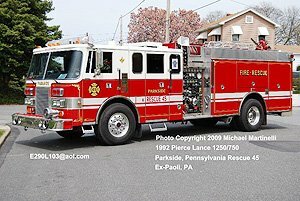 Rescue 45 is a 1992 Pierce Lance with a 1250 gpm pump with a 750 gallon booster tank 1,000ft of 5" supply line. This unit has numerous attack lines, a complete Hurst system, thermal imaging camera, and is also our primary peice for Rapid Intervention to many surrounding communities. Rescue 45 runs first on all gas leaks inside a structure and co calls, auto accidents and cover ups. 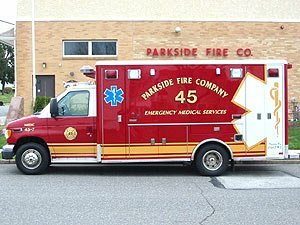 Medic 45-7 is a 2003 Horton Type III ambulance on a Ford Chassis. The unit has on-spot chains for bad weather situations, LED warning light package, rear back- up camera and a dual operating control panel in the patient compartment. 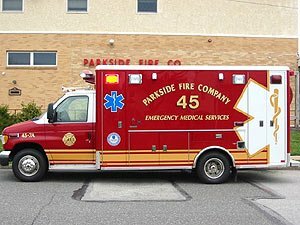 Medic 45-7 is the station's primary response apparatus for Advanced Life Support calls and is staffed 24/7 with a combination of personnel from Crozier Chester Medical Center and Parkside Fire Company. Primary ALS protection is provided to the boroughs of Upland and Brookhaven in addition to Nether Providence and Chester Townships. 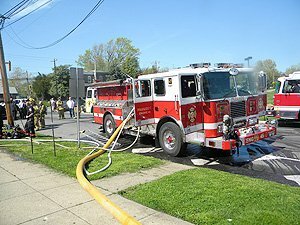 Mutual aid is provided to the City of Chester on an as needed basis. Ambulance 45-7a is also a 2003 Horton Type III ambulance on a similar chasis with identical options to the medic unit. 45-7a is the station's primary response unit to Basic Life Support calls. The unit is completely staffed by volunteer personnel of the Parkside Fire Company. The unit carries an AED for cardiac patients.